My parents officially divorced, or officially sought to initiate divorce proceedings, somewhere around the beginning of my sophomore year of high school. I remember them talking to us about it. At the time, it wasn’t really a surprise. As kids, we’d seen the writing on the wall- our parents (while faithful) had lived apart for years due to jobs, and their mutual want to keep us in a good school district without interrupting our daily lives. What I never expected to come out of this time, despite it’s sadness, was some wonderful memories with my Mom. My sisters were younger, and therefor had less say in visitation. So every Sunday, they’d be with my Dad, which meant I had that whole day alone with my Mother. Mom had always done special things on Sundays. Mostly because she worked a ridiculous schedule during the week, and after catching up on sleep on Saturday morning- she was able to do her thing on Sundays. We’d reguarly be treated to her infamous omelettes after church for brunch. Or we’d come home to ‘smorgasbord’. Mom would literally let us pull out every single deli lunch meat and sliced deli cheese in the fridge and pile them high on the kitchen table. We’d pull out every condiment we could, not just pickles and mayonnaise. Everything! It was super exciting. Especially since for once, we could use whatever we wanted to create our very own sandwich creation. If it was on the table, it wasn’t off limits. It was awesome, and free-ing. Then came the Sundays when my little sisters couldn’t be there anymore. Sunday ‘smorgasbords’ weren’t any fun anymore. They just weren’t the same. So understandably, they ended altogether. We decided to make the best of it though. My Mom and I ended up creating a new tradition- Sunday Suppers. Basically, it meant we had a gourmet meal planned every Sunday evening that only my Mom & I would enjoy. 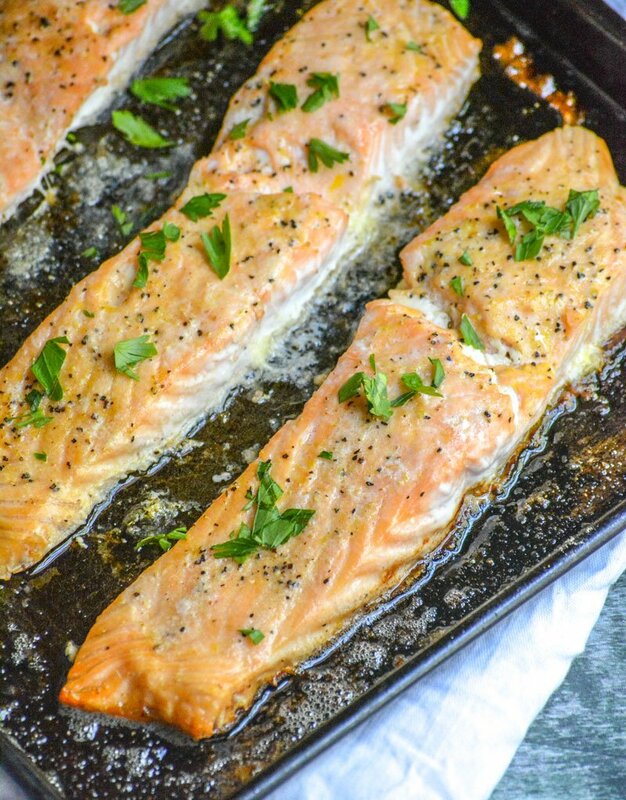 My sisters were younger after all, they were easily put-off by things like salmon patties, crab patties, medium rare steaks, and even this simple recipe for Oven Baked Buttery Lemon Pepper Salmon. We’d have loved for my sisters to be there, but they wouldn’t have like anything we were eating. It was a weird thing that made us feel better, while missing them all the same. 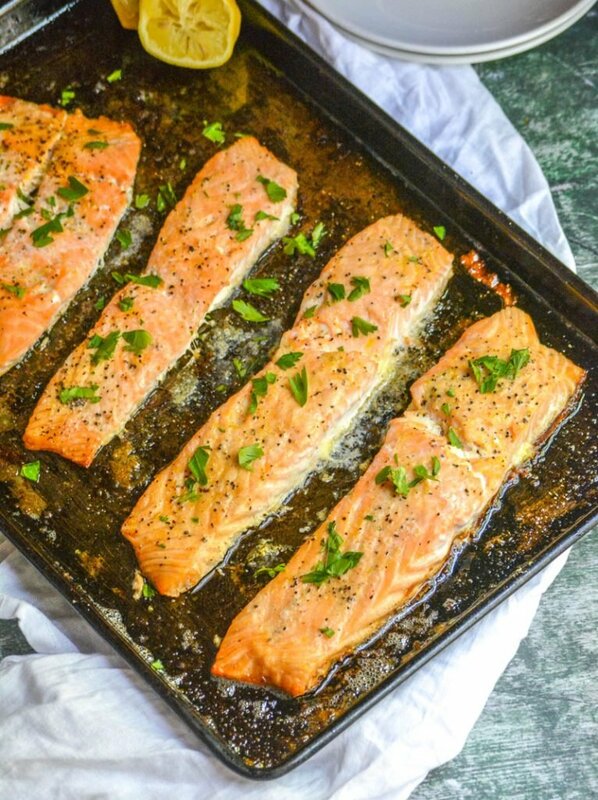 I’ll forever cherish the memories I made with my Mom though because of it- especially this Oven Baked Buttery Lemon Pepper Salmon. I wonder if I’d ever have experienced it otherwise. It happened to be a genius, almost ‘accident’ creation by my Mom at the last minute. One of those she’d had some salmon at a restaurant, so bought some on a whim at the grocery store not too long afterwards, and then needed to use it. What to do? What to do? Lemon pepper was our go-to seasoning, so that was really a no-brainer that we’d be using it in an experimental recipe. Butter? Well I’m not sure how my Mom knew that that would be better than, say olive oil? But she did! While my Mom does use recipes, I don’t think she’s ever really needed one to whip up something utterly delicious. On top of delicious? 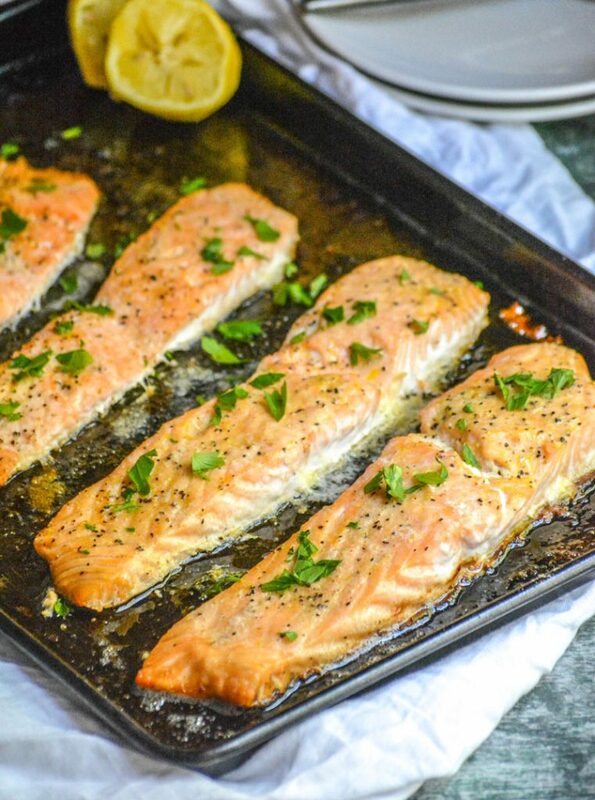 Salmon is good for you! Really good for you. It’s a healthy, high quality protein rich in Omega-3 fatty acids, Vitamin B, and potassium. Studies have shown that it can help reduce inflammation, possibly can help aid in weight control, and maybe even reduce the risk of heart disease. There’s literally no reason not to be eating or enjoying this particular fish, especially when it tastes this darn good. 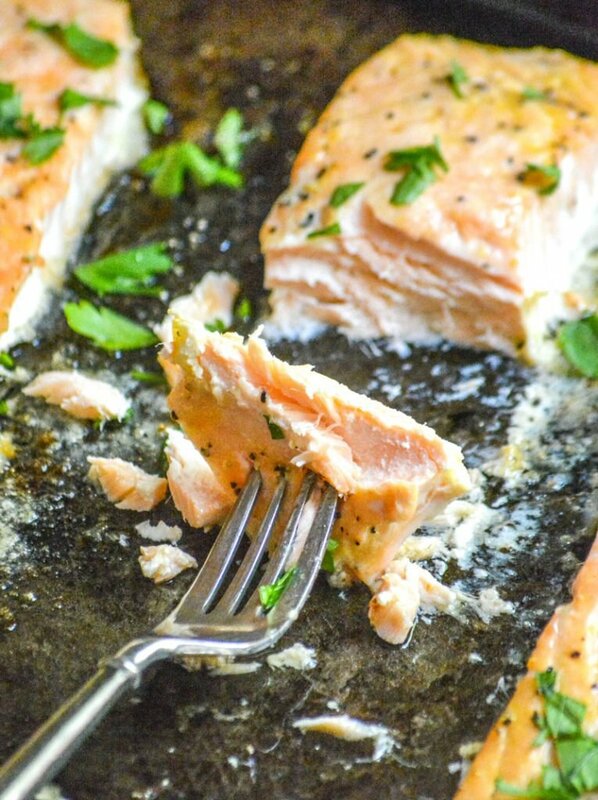 Boneless, skinless salmon fillets are salted & generously seasoned with lemon pepper seasoning. Topped with pats of butter, they’re baked in the oven to juicy tender perfection. Sprinkled with freshly sliced parsley, and served with sides of steamed broccoli & wild rice- it’s bliss on a dinner plate. 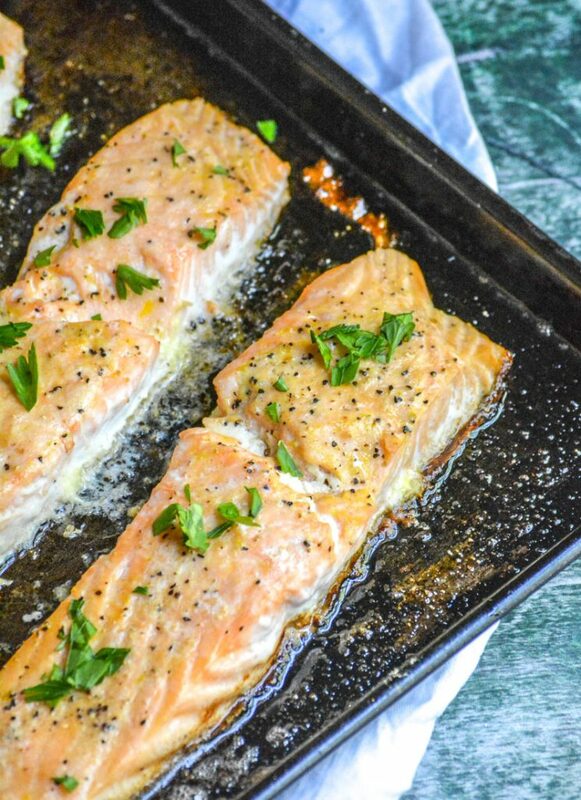 Make a batch of this Oven Baked Buttery Lemon Pepper Salmon, and make a memory with someone you love. 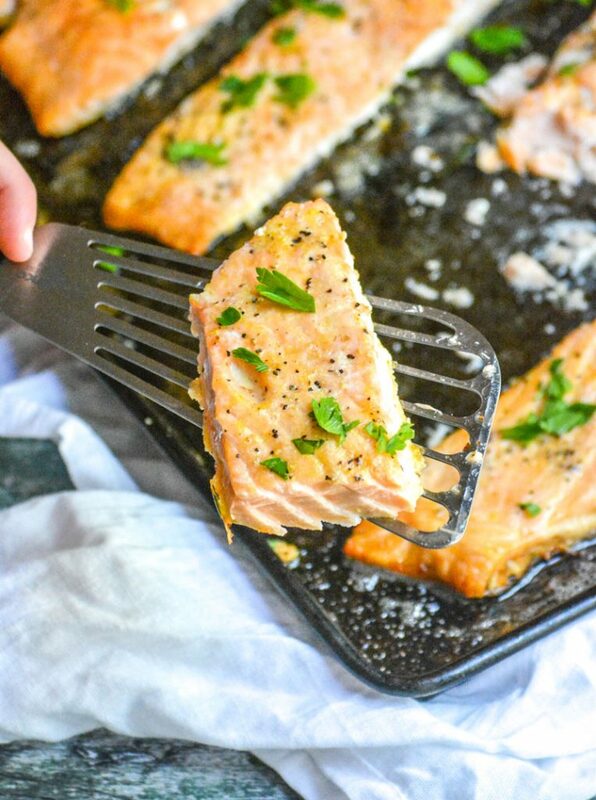 An easy way to make the most delicious, this recipe makes lemon pepper buttered tender seasoned salmon quickly & easily in the oven. Salt your salmon, to taste. Slice it into fillets- roughly 4-6 ounces each. Pat each fillet dry with a paper towel, then place the fillets evenly out onto a sheet pan sprayed lightly with non-stick cooking spray. Sprinkle each filet with a heaping teaspoon of lemon pepper seasoning. 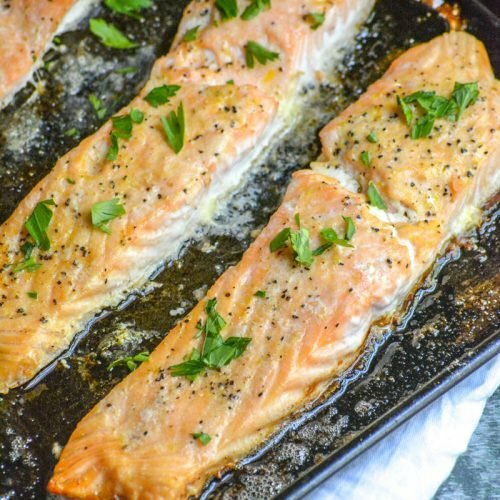 Top each piece of salmon with a tablespoon of butter. If you like things on the less buttery side, just use a half tablespoon. Bake at 425 degrees and cook for 5-6 minutes per 1/2 inch thickness of the fillet. 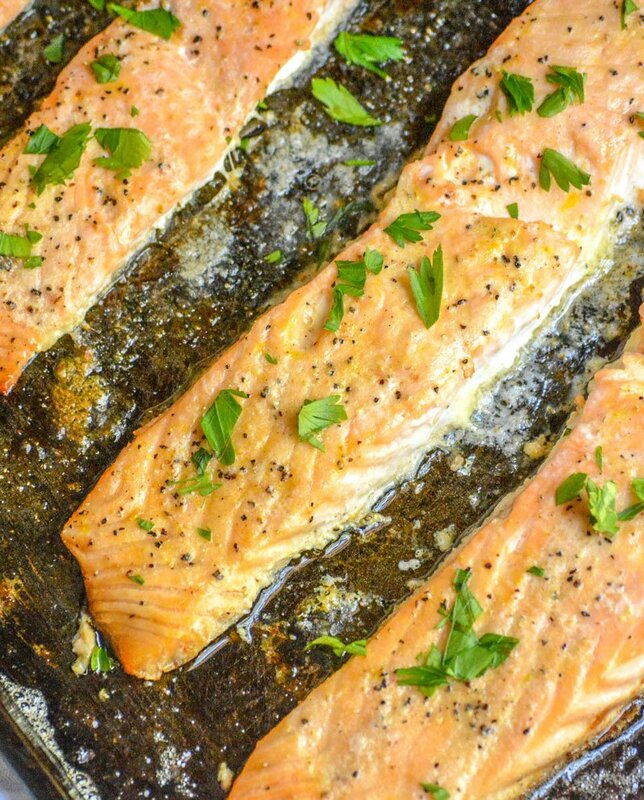 Remove the cooked salmon from the oven, serve immediately with your favorite sides. This is right up my alley! Yum! Thanks for sharing on Fiesta Friday! I can see where you’ve gotten your love of cooking.